Unknown1:10 AM 0 sweets for free! I came from Bacolod City, the City of Smiles known for its Masskara festival. 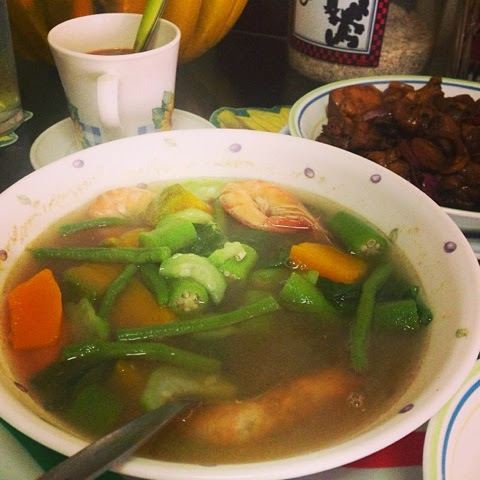 Our favorite local dish to prepare at home (especially when I'm sick) is "laswa" (with the accent on "las"). It is a clear vegetable soup! It's easy and quick to prepare and is made mostly of greens and just add prawns if you like! The thing is, I don't want to spoonfeed you with the ingredients. The way to cook Laswa is really simple and quick. You would just need to estimate the number of vegetables you need to include. Our family would usually cook it with the ingredients that can be found on our backyard. It is very nutritious because it rich in vitamins and minerals plus it has a lot of fiber. Eating healthy food means you are nourishing your body from within, thus giving you beautiful skin. 2. Put the onions and tomato and cook for 3 minutes. 3. Add shrimp and shrimp paste if opted. Cook until the shrimps turn orange. 4. Add okra, eggplant and squash and let it cook for 5 minutes. Tip of the day: Jergens Moisturizers work hand in hand with a healthy diet and exercise in keeping your skin stunningly beautiful. Apply your favorite Jergens variant twice a day to reveal your most beautiful skin yet!